There are many options out there for people looking to invest in gold. Gold ETFs, government-issued bullion coins such as American Gold Eagles and Canadian Gold Maple Leafs, as well as private mint bullion rounds and ingots are all viable and effective ways to hold gold. Collectors and investors looking for something different though, might want to consider having a look at Mexican Gold Pesos. Ever since its founding by colonial Spanish authorities in 1535, the Mexico City Mint has produced large quantities of silver and gold coinage in countless varieties. The most widely-used of these coins, the Mexican silver dollar (also known as the eight real coin or the ‘piece of eight’) was even used around the globe as a standard currency of trade. At present, the Mexico City Mint produces the Libertad line of silver bullion coins. The .900 fine Mexican gold peso series of coins minted off and on, in various denominations, from 1905 to 1996. The coins of this series are both beautiful and easy for potential buyers to find, and their qualities appeal to gold bullion investors and coin collectors alike. Gold pesos minted from 1905 on were denominated into 2, 2½, 5, 10, 20, and 50 peso coins. The mintage histories of all of these gold coins contain significant gaps by year, but none of the genuine coins should bear dates outside of 1905 to 1959. Further confusing matters is the fact that numerous restrikes exist: many of the Mexican gold pesos on sale today, that bear old dates, were actually minted as late as 1996. If you’re a collector interested in procuring specific dates for their numismatic values, you should make sure you buy your gold pesos from a trusted and expert coin dealer. 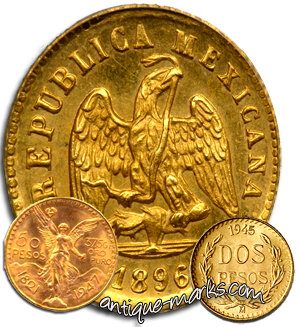 The modern Mexican gold pesos dated 1905 to 1959 are easily recognized. Except for the 20 peso coin, they all bear the same reverse: an eagle standing on a branch, facing forward, with a snake in its mouth, surrounded by the inscription “ESTADOS UNIDOS MEXICANOS”. The reverse of the 20 peso coin bears the same inscription, but the eagle is facing to the side. Luckily, these coins are also easily distinguished from each other by their sizes and obverses. The tiny, 13 mm diameter 2 peso coin only bears the inscription “DOS PESOS” on its obverse. while the 20 peso coin (28 mm, slightly smaller than a U.S. half dollar) depicts the Aztec Calendar. The most famous of these coins, the 38 mm, dollar-sized 50 peso coin, portrays the female symbol of Winged Victory. In addition to their face values, the 20 and 50 peso coins also have their gold weights (15 grams and 37.5 grams, respectively) helpfully inscribed on their obverses. For gold investors and coin enthusiasts looking to diversify their gold coin collections, there are few better choices than Mexican gold. The gold peso is recognized around the world, as are all of the silver and gold coins produced by the nearly 500 year-old Mexico City Mint. Gold pesos also feature a variety of interesting and beautiful designs that add significantly to their intrinsic values. Perhaps the best aspect of the Mexican gold peso series is its large selection of denominations. Buyers on even the tightest of budgets should be able to easily afford the small 2 and 2½ peso coins. While coin collectors who can afford to make larger purchases have the option of buying the massive, dazzlingly beautiful, 20 and 50 peso coins. A significant benefit of collecting Mexican gold pesos is the low premium relative to other gold coins. Mexican Gold peso coins can usually be bought for a scant 3 to 4 percent premium over their base values in gold. The difference in premiums is especially evident when buying smaller denominations. Fractional gold bullion coins almost always sell for relatively large premiums because of the extra costs associated with their production. The 1/10th ounce Krugerrand and the 1/10th ounce Canadian Gold Maple Leaf, for example, regularly sell for prices 20 to 25 percent above their base gold values. The similarly-sized 2, 2½ and 5 peso gold coins, on the other hand, regularly sell for prices around five percent or less above their gold values. There really is no better choice for coin collectors on the hunt for small gold coins. A warning for American buyers, The only real drawback to buying Mexican gold pesos is that they are not approved for investment in IRAs. Only .999 and above fine bullion products and 22-karat American Gold Eagles can be invested as a part of an IRA. Because they’re made of a 90% gold & 10% copper alloy, Mexican gold pesos are physically sturdier and less prone to wear than pure gold bullion coins, but that composition unfortunately excludes them from investment in an IRA. Ensure you take this restriction into account when buying Mexican Gold Pesos as an investment for the future.